One of the newest trends in beading is bead and wire crochet. This unique art creates beautiful jewelry that can be delicate, bold, lacy or chunky. With a few simple tools and some creativity, you can create necklaces and bracelets that will look professional and gorgeous. What is Bead and Wire Crochet? Wire crochet with beads combines the technique used for crocheting and the art of beading. It involves crocheting chains in wire just as you would in yarn, and you add beads of your choice to make the piece even more dramatic. In order to do wire crochet, you will need only a few simple materials. 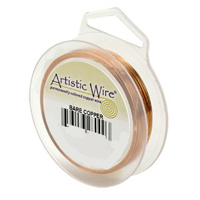 Choose soft-temper wire that is between 28-gauge and 34-gauge for the best results. Artistic Wire, Beadsmith, silver-filled and precious metal wires are good wire choices. The size of wire that you use should correspond with how delicate or chunky you want your piece to be, although it will also be determined by how large your beads are. You will also need a crochet hook, wire cutters, flat nose pliers, needle nose pliers and beads of your choice. There are several colors of wire available for you to use in your bead and wire crochet. This can add even more personality to your project. Choose a color that complements the beads that you will be using. You can mix together multiple strands of bead and wire crochet to make your pieces bolder and chunkier. You can also fill in spaces with a piece of wire that has been crocheted without any beads. Do not cut the wire until after you have finished crocheting the strand. This will ensure that you have enough wire to complete the strand. If you are using multiple strands, make sure that you spread out beads of different sizes. Try to mix them so that the same beads will not overlap once you braid them together. Remember that you won’t need as many beads as wire. The wire crochet will take up more space, and the beads will be used to accent the design. It may take some practice for you to determine exactly how many beads you will need for your necklaces and bracelets so pre-string extra. Bead and wire crochet is a fun way to mix two popular hobbies. The result is beautiful jewelry that looks like it took months to make yet is actually done in a very short amount of time. You will quickly learn how to combine various beads and wire gauges to create pieces that you and all of your loved ones will enjoy! Wire is one of the most versatile tools that you can use while making jewelry. There are many gauges of wire available to help you create a variety of styles and designs, and you may easily become confused by the vast selection that is available. Here is a simple guide that will help you choose the perfect wire for your next project. Wire is available in many gauges, and the average sizes for jewelry use range from 10 gauge, which is the thickest, to 34 gauge. The larger numbers are used for thinner wire, while smaller numbers are used for thicker wire. The most commonly used gauges are those between 18 gauge and 24 gauge, and a wise jewelry maker always has them on hand. For long-wearing jewelry, choose the largest gauge that will still give you the look that you want. Wire that is between 10 gauge and 14 gauge are the thickest gauges that are typically used for jewelry making. While there are thicker gauges on the market, most jewelry makers don’t work with wire that is thicker than 10 gauge. 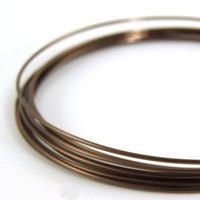 Wire that is between 10 gauge and 14 gauge is bulkier, which makes it perfect for bold and dramatic projects, including bangle bracelets, bold jump rings, clasps, neck rings, links and connectors, and wire sculpture. Thick gauges also work well for chains, as well as making head or eye pins for beads with large holes. These wires require heavy duty jewelry tools. 16 gauge wire is still considered to be very thick. While regular jewelry tools can be used on it, heavy duty tools are better designed to work with 16 gauge wire. Its bold look is ideal for clasps, chain maille, wire wrapping, heavy jump rings, links and connectors, wire sculpture, chain making, and headpins and eye pins for larger hole beads. 18 gauge is still very thick, and it is the gauge that most jewelry makers reach for when they want bold, dramatic jewelry. 18 gauge is used for clasps, eye pins, links and connectors, wire wrapping, chain maille, thick ear wires, jump rings, chain making, charms and rings to wear. 18 gauge wire will fit through many beads, but not all of them. You may use regular or heavy duty jewelry tools when working with it. 20 gauge wire is another good basic size to always have on hand. It is perfect for ear wires, wrapping, wrapped links and connectors, headpins, eye pins, jump rings, split rings and rings to wear. This size fits through most bead holes, and it can be used with regular jewelry tools. 21 gauge wire is a specialty size. It is suitable for the same projects that would be created with 20 gauge wire, and it is ideal for creating ear wires. You can manipulate 21 gauge wire using regular jewelry tools. 22 gauge wire is another good basic size to have on hand at all times. It is ideal for thinner ear wires, wire wrapping, wrapped links and connectors, headpins, wrapped eye pins, jump rings, and rings to wear. 22 gauge wire will fit through most bead holes and can be used with regular jewelry tools. 24 gauge is the thickest of the thin wires. It is often used for wrapped headpins and eye pins, earring dangles and wire wrapping. 24 gauge wire bends easily and will sometimes need to be straightened with your fingers. This gauge is not used as ear wires because its thinness can make them uncomfortable to wear. It fits almost all beads, including gemstones and pearls, and you can use regular or fine jewelry tools to work with it. 26 gauge wire is thin and delicate. It is used for wire crochet, wire wrapping and wire wrapped links. It is also used for wire wrapping tiaras. 26 gauge bends very easily and may kink, although it is easy to straighten. It fits most beads, including gemstones and pearls. While regular jewelry tools will work with 26 gauge wire, fine tip pliers are more suitable. 28 gauge is a very thin wire that is used for delicate projects, including wire crochet, braiding, wire wrapping and wire weaving. It bends easily and may kink. Fine tip pliers are ideal for 28 gauge wire, but you may also use regular jewelry tools. 30 gauge through 34 gauge wires are extremely easy to bend, and they may kink. These ultra-thin wires are ideal for wire crochet, although they may also be used for wire wrapping and weaving. Regular jewelry tools can be used to manipulate wires of these gauges, although fine tip pliers work better. Now that you know the differences between the gauges and how they can be used, you can incorporate wire into your projects. Experiment with different beads, wires and designs to make an assortment of beautiful jewelry. Grab some different gauges, and let your creativity reign!